National Scientific Council on the Developing Child. 2007. The Timing and Quality of Early Experiences Combine to Shape Brain Architecture. Center on the Developing Child at Harvard University. 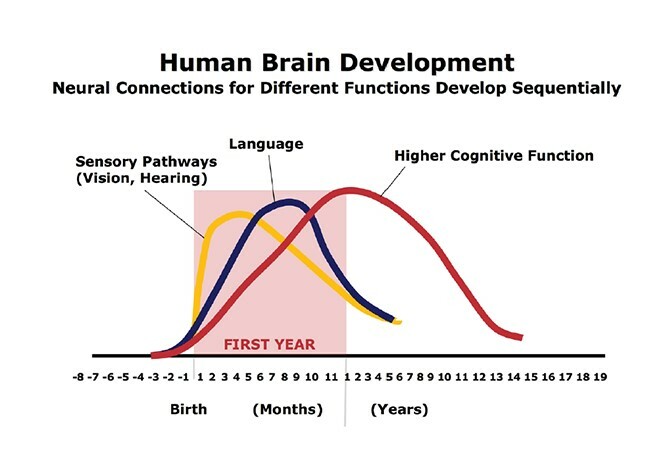 This working paper explains how brain architecture is formed in the early months and years of a child’s life, factors that improve development and put it at risk, and broad policy implications based on these findings. Taylor Robbins, Shannon Stagman, and Sheila Smith. October 2012. Young Children at Risk: National and State Prevalence of Risk Factors. National Center for Children in Poverty. This report uses national and state data on established factors that put young children at risk for early gaps and subsequent failure to document the scope and scale of problems facing US children. Bruce Bradbury, Miles Corak, Jane Waldfogel, and Elizabeth Washbrook. 2015. Too Many Children Left Behind: The US Achievement Gap in Comparative Perspective. Russell Sage Foundation. Chapter 3, Resources for Children (pp.40-66): This chapter sets out the various resources and factors that drive, and impede, healthy child development and the links between inequitable resources and early achievement gaps among US children compared to their peers in Australia, Canada, and the UK. Emma Garcia. June 2015. Inequalities at the Starting Gate: Cognitive and Noncognitive Skills Gaps between 2010-2011 Kindergarten Classmates. Economic Policy Institute. This paper documents in detail the large gaps across social class groups and, to a smaller extent, racial groups, in achievement in both reading and math and in such social emotional skills as self-control and persistence. It concludes that these gaps, which are not driven by schools, are also very difficult for schools to close, and that public investments in early supports for children and their families are critically important. National Women’s Law Center 2015. Set up to Fail: When Low-Wage Work Jeopardizes Parents’ and Children’s Success. This comprehensive report from the National Women’s Law Center, which combines quantitative data on low-wage families’ situations and input from interviews with those families, including child care workers themselves, demonstrates the market failure that puts quality child care out of reach for many US families while also providing very low pay and little support for those who care for and educate our youngest children. Hart, Betty; Risley, Todd R. The Early Catastrophe. The 30 Million Word Gap. American Educator, v27 n1 p4-9 Spr 2003. This much-cited study involved intensive work in the homes of 42 professional, middle, lower-social class and welfare families that explored how and how much parents talk with their children. Results at age three and from follow-up at 3rd grade with some families indicate the strong influence of early interactions at home on young children’s vocabulary and other language development. Moore, Kristin; Manlove, Jennifer; Richter, Kerry; Halle, Tamara; Le Menestrel, Suzanne; Zaslow, Martha; Greene, Angela Dungee; Mariner, Carrie; Romano, Angela; Bridges, Lisa A Birth Cohort Study: Conceptual and Design Considerations and Rationale. Working Paper Series. (NCES US Department of Education 1999) This paper by some of the preeminent ECE scholars, sets out the complexity of studying young children and introduces a key dataset for such work – the Early Childhood Longitudinal Study, Birth cohort (ECLS-B). Elaine Weiss and Emma Garcia. June 2014. Segregation and Peers’ Characteristics in the 2010-2011 kindergarten class; 60 years after Brown v. Board. Economic Policy Institute. This paper uses data from the ECLS-K data set to document the disparate types of classrooms in which children of color begin school, in contrast to those of their white peers. It finds high levels of segregation by minority racial and ethnic status and social class, such that even poor white students are more likely to land in low-poverty classes than are their middle-income black and Hispanic peers. It also reports a range of associated disadvantages for children of color, including differences across schools in parents’ education status and changes in achievement gaps during that kindergarten year. Paul Tough, Whatever it Takes: Geoffrey Canada’s Quest to Change Harlem and America. 2008. Chapter 2, Unequal Childhoods, explores Canada’s growing recognition of how limited Harlem parents’ access is to the kinds of information and other resources that he and his wife can take for granted regarding child development and how to enhance it through specific activities. Indeed, this inspired much of his thinking around the development of the Harlem Children’s Zone Baby College and other HCZ programs. Harvard Center on the Developing Child. Brief: The Science of Early Child Development. Inequalities at the Starting Gate finds that the most socioeconomically disadvantaged children lag substantially in both reading and math skills, and that these skill levels rise along with social class. As such, poor children face substantial obstacles to school success. For example, children in the highest socioeconomic group have reading and math scores that are significantly higher—by a full standard deviation—than scores of their peers in the lowest socioeconomic group. 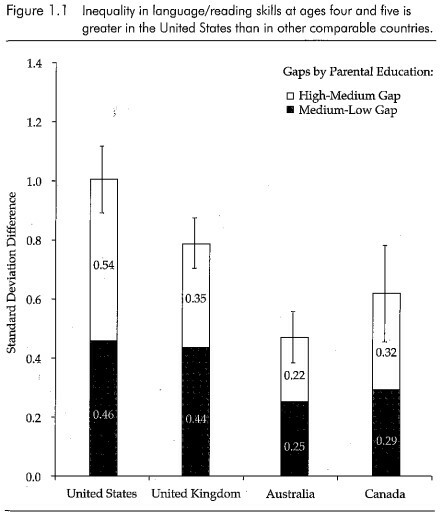 A combination of greater income gaps across social classes, much less support for parents from both workplace and government, and disparate access to quality early education, which would narrow them, leads to larger gaps both between low- and middle-SES children and also between middle- and top-SES US kids compared to their peers in similar countries. Book Club: The Youngest Minds, by Ann B. and Richard Barnet. Simon and Schuster 1998. In their exploration of research on child development, this husband-wife, policy analyst-neurologist team translates important evidence on brain science, psychology, and parenting into accessible, readable terms that also can help guide policy action. The authors explain how disadvantaged circumstances stand in the way of healthy development for too many American children and also how those poor odds can be overcome with the right policies and interventions. The latter includes an overview/summary of the impacts and benefits of quality early childhood education programs. Video: Brain Hero (This three-minute graphic video from the Harvard Center for the Developing Child illustrates the complexities of brain development, early obstacles infants and toddlers must overcome, and consequences when they don’t, as well as policy implications to enhance young children’s healthy development. Given the critical importance of laying a strong foundation for early brain development, why is there such a lack of investment in young children and their families in the United States? How might we learn from other countries – in particular, those with similar economic and political systems – in order to narrow this gap? How do race and poverty interact in these early years to create early achievement gaps? And which interventions might be most helpful in mitigating those impacts and narrowing (or even averting) the gaps? Based on what you have read here, how much of the achievement gaps we see in elementary school, middle school, and even at high school graduation are likely due to school influences versus the persistence of gaps already accrued when children entered kindergarten? Like the other sessions in this MOOC, BBA thanks Andy Donlon for his helpful contributions.